Over time, old fuel can clog and harm the delicate parts of your Briggs and Stratton Carburetor. 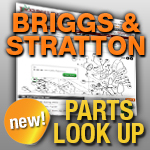 Diaphragm and governor springs are important in keeping your Briggs and Stratton 4-Cycle engine running at its peak. Rely on Jack’s to supply the replacement Briggs and Stratton Carburetor parts to get you back to work fast and easily.